BoothStar Photo Booth Hire provide portable, instant photo booth rental! BoothStar are here to supply you with an exciting, accessible, unique and alternative way to entertain your guests whilst capturing precious memories on high resolution photographs. Whether you want a photo booth as a way of collecting photographs for your guest book, or as a means of all night entertainment, BoothStar will help fulfil both objectives. You can rent our photo booths for any kind of event – including parties, civil partnership ceremonies, weddings, bar mitzvahs, anniversaries, corporate events, charity functions and product launches. Photo booth hire is available nationwide, including popular locations like London, Manchester, Birmingham, Nottingham, Bristol, Southampton, Leeds and Cardiff. 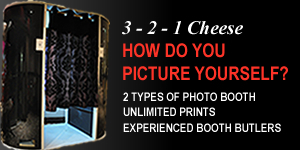 Why hire a photo booth for your event? Remember bundling into a photo booth with all of your friends and pulling silly faces? Or what about that romantic kiss you shared in a photo booth with your first love? It's these feelings of nostalgia that bring people to life when they step into a BoothStar photo booth. BoothStar have over 6 years experience in the events and weddings industry. Their customer service is second to none and they provide a professional and reliable service with high quality, personalised photographic prints. If you're planning an event or party, photo booth hire is perfect for capturing your guests at their absolute best. BoothStar offer a range of photo booth hire packages, from the Premium wedding photo booth to the Pod. Whether you require a retro experience with a vintage look and classic strips, a sleek and stylish modern unit, or a fully customised corporate booth, BoothStar provides it all!